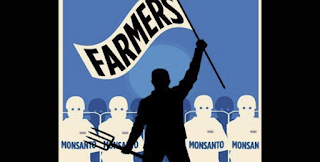 I read this article today about farmers who are about to sue Monsanto. This is awesome, but it is tinged with such sadness. Monsanto has so much to be guilty of with their greed and their total lack of care when it comes to the farmers. The stupid part is that if Monsanto didn't have the support of the farmers ... well, there would be no Monsanto now would there. It's now time for the farmers to fight back. There is a farmer committing suicide every 30 minutes. That's totally reprehensible. But Monsanto is welding such a huge stick over these farmers by demanding that they pay royalties for any renewal seed. That's seed that has been harvested from the original crop and planted again. So they are fighting back and there are 5 million farmers. Yes, you read that correctly - 5 million!!!! 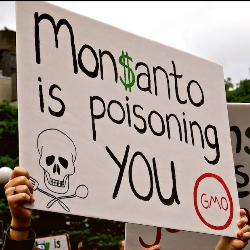 With any luck, they may be able to put Monsanto and it's corrupt and nasty ways out of business. This is something that I will be watching with interest. I came across this statement today which got me thinking …. again …. about what we can do in regards to cleaning up the environment and help diminish climate change. This came from a study that the European Commission commissioned in 2012. Of course this small dietary change really isn’t sufficient, there really has to be a really significant reduction in meat and dairy before we’ll see any real effect in climate change. If only that would happen! Unfortunately, I can’t see it happening any time soon because the human brain is wired to believe that it must eat meat. What I have noticed is that the age old argument of “meat provides us with protein” and “dairy provides us with calcium” isn’t standing up as gospel anymore as people are becoming more educated and understand that those arguments are pure fallacy. What seems to be happening now is that people are just saying “but I like meat” which, I have to admit, is at least honest! So what should we do? We should keep educating the masses and get the message out there that animal industry is so incredibly destructive to our planet and things have to change if we are going to have any chance at all in surviving as a species. I've said it before .... so I'll say it again - we need to cut back on the meat, not increase it. I got a bit steamed up the other day when this pic appeared in my Facebook newsfeed. The post said that this is what meat looked like a few days after slaughter. There sure were a lot of comments posted and 95% of them were exactly what I was thinking. This photo is scaremongering. If the meat were left out in the warm, then yes, it does start to rot, or if it is "hung" as in the case of wild game, then yes, it will start to rot. 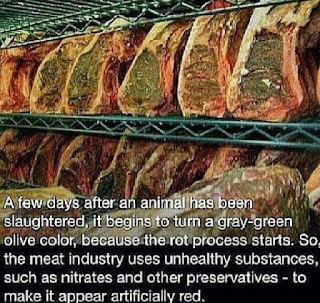 But meat that is processed for human consumption, kept under refrigeration, butchered and packaged immediately does not rot as quickly as it has been made out to do. 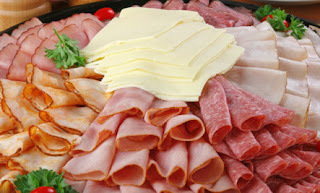 This is going out to a world audience, the posting page, who is from the USA where perhaps the process from kill to package is not as quick and where nitrates and preservatives are used to give meat a much longer shelf-life is commonplace, should realize that not all countries use this method. 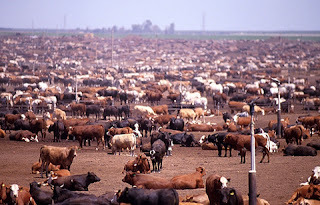 I am not condoning the meat industry one little bit, but the way I see it, images such as this gives vegans a bad name. Not one meat eater will be turned off meat by this type of image. as proven by the comments. Meat eaters are masters at telling lies to themselves, coming up with insane excuses and are extremely defensive when confronted by this type. Instead, we vegans and vegetarians should be leading by example, encouraging meat-eaters to watch documentaries such as Earthlings and promoting things like Meatless Mondays. And as for the posting page? Not only was the photo not the best one to post, but the replies to the non-believers of the image were not in good taste ..... hahaha, bit like the meat!!! Some cows do fight back! 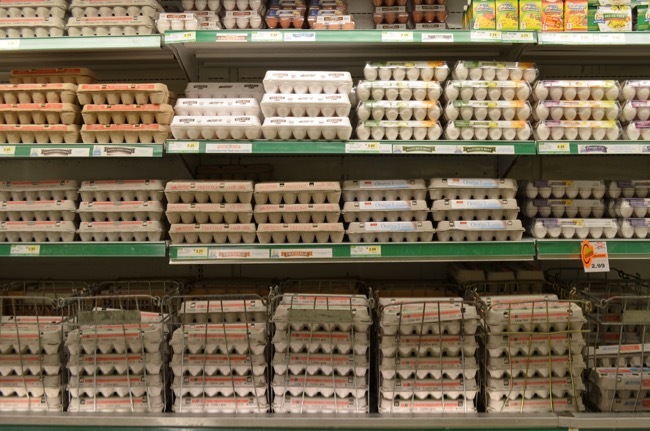 Do You Understand The Labels On The Egg Carton? There have been several times people have told me that they only buy free range eggs and their belief is that if the chickens are free-range, they have a much better life than chickens in cages. Well in a way they do … heck, anything would have a better life if it’s not cramped up living in a cage. But is a confinement of any sort just as bad? 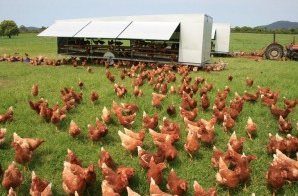 So do you know which eggs truly are free-range? and, what constitutes free-range? 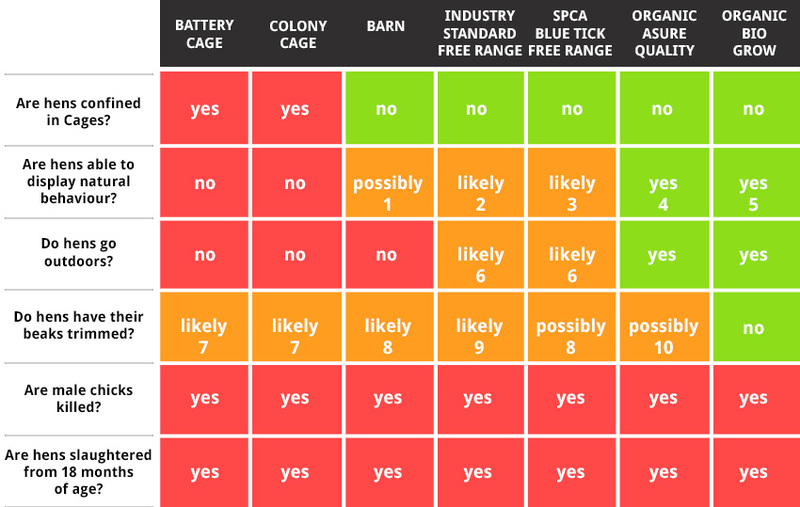 Back in 2013 I wrote a post "Do You Buy Free Range Eggs?". Well, it's now 2015 and nothing really has changed. So here's a bit more information for you. I think we'd all agree the words “battery” “caged” even “colony cage” all mean that the hens are living in cages. And, “barn raised” or just “barn” would mean that the hens live in a barn and not out doors. But it’s when we get to the words “free-range” that the mis-interpretations happen. Free-range conjures up visions of chickens roaming around lush, green pastures just doing their thing. And yet when questioned, most people have no idea how the farmer collects the eggs from these free-ranging hens. That part, we don’t think about. 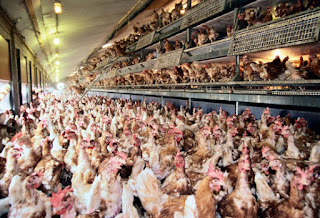 The truth is most “free-range” hens actually spend most of their life in barns. Barns that have doors that lead to the outside. Of course, because the barn is full of hens, most of these chickens never reach the doors and therefore live their lives in a barn. But, technically, they are free-range because they have the choice to go outside. It usually is a matter of just how big the commercial operation is. How many chickens are on the farm and the logistics of feeding, egg collection etc. 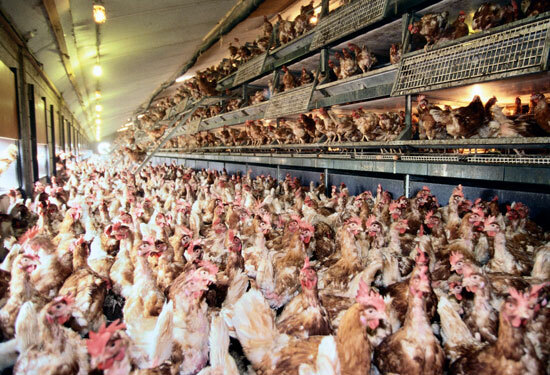 as to how "free-range" they are. I think the best idea I’ve ever seen is a movable nesting box called a "Chicken Caravan" which is made in Australia. The beauty of this is that the farmer is able to move the chickens to fresh paddocks when needed and bring the nesting box at the same time. The hens then are able to lay their eggs when the desire takes them. Just so you know, a lot of commercial free-range companies are owned by large corporations that also have caged hens. Where does that put you if you buy free-range for ethical reasons? 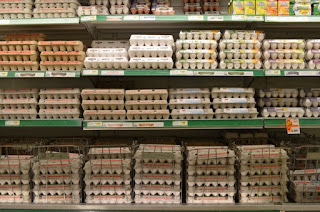 O.k., you’re happy having “free-range” and you trust the brand on the egg carton because you have researched them. But let me ask you this. 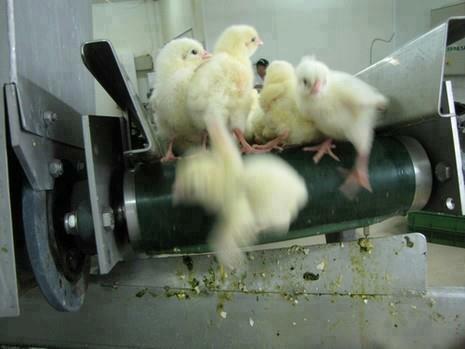 Do you know what happens to the chicken at the start of its life and when she no longer can produce eggs? Remember, this is a commercial operation. This is the farmer’s livelihood. He must get his young chickens from somewhere because he won’t have the room to breed them and he has to get rid of the older hens when they are no longer economically viable. The chickens come from the same place that battery hens do - a breeding farm dedicated to raising female hens for the egg market. The baby chicks at one day old are inspected - if female they live, if male they go straight into the chute that drops them into a grinder or crusher …. ending up as animal food or fertilizer. There’s no let up at the end of the chicken’s laying life. Once she can no longer lay profitably (which is usually around 18 months), she is then crammed inside transport cages along with others and trucked to slaughter never with any food or water on the journey. The killing process is usually pretty archaic, barbaric and torturous especially in the U.S. - killing which is deemed illegal with cattle or pigs is acceptable for fowl. Even in 2015, it still continues. If you’ve read this far and still going to eat eggs then check out the photo below. If you think you might try eating less eggs or giving them up altogether there are many ways you can replace the egg with plants. My Vegetarian to Vegan (get it here) book is a big help … plug, plug!!! or you can just type into Google “egg substitute” and you’ll get lots of ideas. I'm going to leave you with a chart recently put out by SAFE (N.Z. animal welfare group). You'll find it easy to understand and you'll have a lot better idea what the labels really mean. 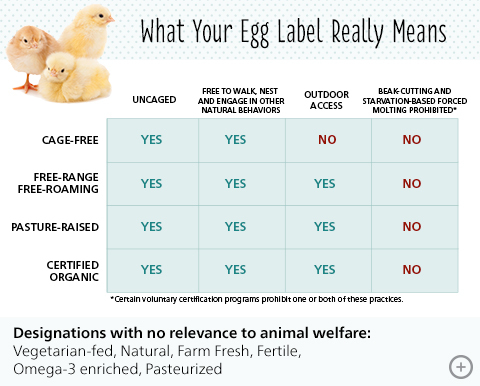 Below that is the U.S.A. chart - slightly different as, except for “certified organic,” the U.S. government does not set definitions or requirements for egg carton labels. (If you live in other countries, you'll probably find that one of these charts will fit your country's labels). Be very wary of anything else on the label such as the words "natural" - most of it is marketing hype. 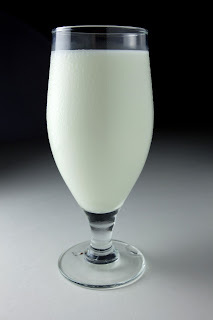 I haven't really talked much about the dairy industry and the different types of milk that's on offer, mainly because I know that most of my readers still use dairy. Plus the fact it's like "where do I start"? There are so many dairy products out there, that I'm just glad I don't have it because I wouldn't know where to begin choosing which milk would be right for me. However, I recently learned about a new product that's been launched that has me shaking my head with skepticism....which meant, I felt the need to blog. Currently there has been quite a dramatic drop in the consumer purchase of dairy which is effectively creating a downturn in the dairy industry. This appears to be happening world wide. So dairy companies are trying to come up with ways to increase market share and this latest thing just cracked me up! “Sleep-boosting dark milk” coming from a New Zealand company. Something that's not too new as scientists in Finland have been working on this and it's also now available in Britain. It appears that if you milk the cows after sunset and before sunrise, the milk produces a higher level of the hormone melatonin which is known to help regulate sleep. Oh, the shed has to be dark as well. This melatonin found in the milk after dark can be upwards of 10 times higher than that found in day time milk (or the normal milk). That covers a vast array of consumers doesn’t it? My feeling is that milk is no longer “straight from the cow”. It is bastardized until it’s pretty much unrecognizable, all for the health of the consumers…well, that’s what they want you to think. What I think is that it’s all for the profit. I have a whole chapter on milk in my Nutrition book where I talk about calcium, wrote the book before this new type of milk came out … I’ll have to include it when I do the update. Stick with or change to a good dairy alternative - at least you’ll know it’s good for you. 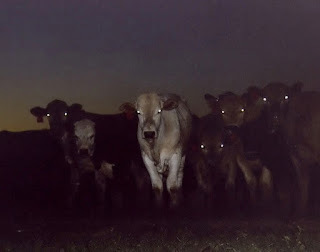 And, one last thing ..... what about the poor cows having to be milked in the dark! I've been following the most awesome food blog for quite some time now. It's the Minimalist Baker and if you have a hankering for some brilliant, easy, tasty vegan food, then check her out. I'll get to the point in a moment. Last week a group I belong to had our monthly vegan meal share and I was at a bit of a loss as to what to make considering the fact that I didn't really have much time. So into the Minimalist blog for some ideas. 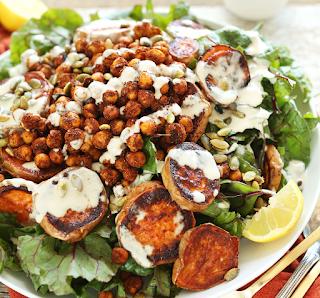 And, there it was, an absolute corker: Sweet Potato Chickpea Salad. Oh, the taste buds started to water and to top it off, it looked easy! The MB did not disappoint! It was easy, it was delish and best of all, it was a hit. But the best part was the Tahini Dressing. However, I did make a bit of a tweak from the one in MB's recipe. But I added about a teaspoon of mixed spice and it just popped! I have since used the tahini dressing on lots of other things like burgers and roasted veggies and salad and pita pockets etc. Do yourself a favor and check out the Minimalist Baker I bet you'll find something ... and tell me if you do. 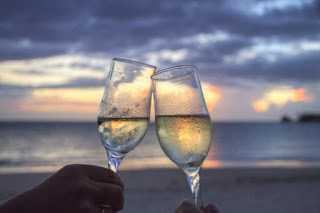 For now, I'm off to get the chickpeas out of the oven to cool for the salad later and to pour a wine.... oooo I might try the dressing with some crackers!